French style painted furniture in a luxurious finish with ornate features and a hint of ivory-cream to the finish. 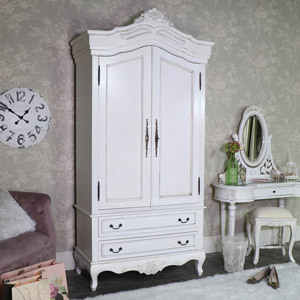 This range has many items to complete a full bedroom set, including an armoire style wardrobe, large ornate dressing table with padded stool, bedside cabinets and a large tall boy style chest of drawers. The vintage painted finish and ornate carving detail evokes a real French Chateau feel and looks amazing in a modern or period style homes, especially if you trying to create an ornate shabby chic style decor with a high-end look, or a French Country Style bedroom. With its ornate style and completely made from solid hardwood, and fully assembled, the quality is hard to comprehend from pictures, constructed in heavy solid wood, with a painting process that means it will stand the test of time , these items are hard wearing and made last a lifetime. Providing great storage space for hanging and storing your clothes, the fabulous wardrobe in this range provides an easily removable hanging rail and removable shelves to allow use as a hanging clothes wardrobe, linen closet armoire, or a combination of both , and over deep drawers on the chest of drawers provide plenty of storage for clothing, whilst the bedside locker style cabinet has plenty of bedside storage space.